In late May, 2005, NaFFAA-Region 8 (a.k.a. 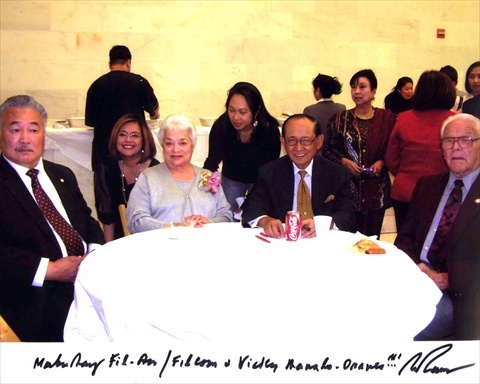 National Federation of Filipino American Associations) was given a task to prepare a potluck reception for Victoria Manalo Draves at San Francisco’s City Hall. A public park somewhere in the South of Market, San Francisco was being named for this famous Filipino American Olympic champion. Viki Bamba, our regional chair, assigned me the task of coordinating the donation of food and beverages for this community reception at City Hall. Mind you, it had never been done on a large scale before. The event was a huge success! I noted our successes and opportunities for improvement. Thus, when Jason Chan, the Liaison to the Asian Pacific American community at the Mayor’s Office, asked me if I could do a “repeat performance” for the first-ever Mayor’s Community Celebration of October as Filipino American History Month within 10 days time, I told him that I wouldn’t do it without the gracious and super-efficient Helen Marte-Bautista, a NaFFAA charter member and a Commissioner of the San Francisco Library Commission, who had been my partner in organizing and managing the food and beverage donations as well as the physical lay-out of the reception area. Jason was able to recruit the talented Al Perez to handle the program. The logistics could have been difficult to handle if it weren’t for the fact that I hadn’t created a checklist for the potential donors to look at. I sent out the following e-mail blast — and crossed my fingers that everything would work out! AND IT DID! We had a wonderful first celebration… Of course, the next year, Jason had a budget to work with — so we were happy to be guests at the 2nd Mayor’s Reception. I am sharing my checklist with all of you so you know that there is an art to preparing an elegant potluck reception. I am not including any lay-outs here, just the basics. Please feel free to use this as your guide in preparing a potluck party or reception. Do let me know how it works out for you, ok? 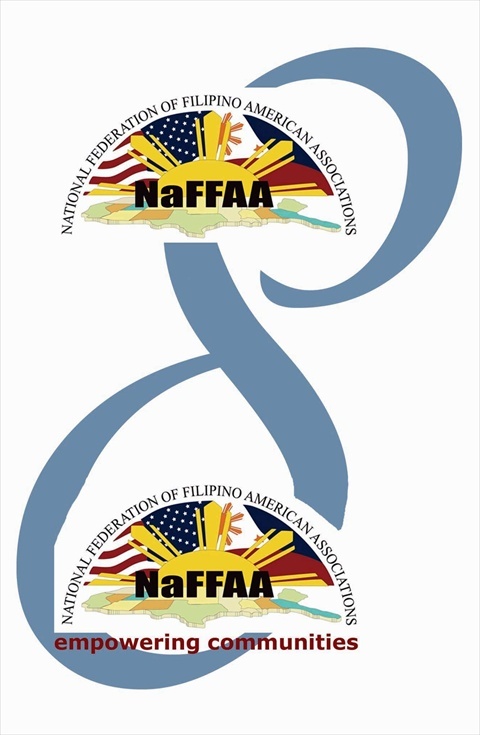 NaFFAA Region 8 - Empowering Communities, concept by Lorna Dietz, rendition by Cheryl Platon, copyrighted 2004. This is an actual e-mail that I sent out on October 18, 2005. BY INVITATION ONLY! Please do not forward to your yahoo groups. Please contact us if you intend to bring guests. We would appreciate having the names of your guests so we can do a head count for the food and beverages to be donated and served. Where You Can Help: On behalf of NaFFAA-Region 8, one of the organizations supporting this event, Helen Marte Bautista and I are co-chairing the Food Committee. This is a volunteer effort — and it is up to us to be resourceful in being able to fund this community celebration. (1)	We are seeking food and beverage donations and party supply donations from all of you who are receiving this invitation — Filipino appetizers or finger food, hors d’oeuvres, and “kakanin” that will be served in trays during the reception, NOT a buffet menu — so that everyone who will celebrate with us can taste authentic Filipino Cuisine. Remember, the food will go to us — we don’t go to the food (except for the drinks, perhaps). Who else but you, our friends, can determine what would be good for first-timers to eat at the Mayor’s Reception to celebrate our Filipino American history!!! (2)	We will need volunteers during the event itself to help us with the set-up, during the event, and break-down. This is the true “bayanihan” spirit calling for all of us to show off our Filipino American history and heritage to all of the San Francisco Bay Area! There is very little time to do this — and although we are calling many of you, please take the pro-active approach and contact us immediately. You can contact Helen Marte Bautists at (415) 564-9765 also. Our thanks to our NaFFAA Northern California Regional Chair, Viki Bamba, for encouraging us to help out in any way we can. This is the most succinct planning checklist I could come up with that we can use in future community events. We used the same formula in putting together the Community Celebration for Victoria Manalo Draves. This is the result of your “bayanihan spirit”! A workable action plan! Remember, we’re all in this together! Since this is sent to you as an “invitation only” event, please contact me asap at April Financial, Inc./Insurance Agency/Intero Real Estate San Francisco Sunset (415) 242-8106, or [email protected] or [email protected] Or, you can contact Jason Chan directly. 1. Deadline for donations: Monday, October 23, 2005. 2. The food must be delivered at 4:00 p.m., Thursday, October 27 at the Grove Street entrance of the San Francisco City Hall. 3. We are expecting around 500 guests from all over the San Francisco Bay Area. If you have a favorite Filipino-owned restaurant, caterer, or retail store selling Filipino food and beverages, please call them and invite them to this event. Ask them, too, if they would be willing to donate food or beverage items good for 50 people (if a small establishment) or 100 people (if a large, well-established business). The goal is for us to patronize Filipino-owned businesses when we make our donations. 4. Get your group of friends, business, or organization to pool your money and patronize your favorite restaurant’s food items for your donation to the event. 5. Since Jason Chan wants to be sure all donations are properly acknowledged, please e-mail me the names of the donors (including the restaurants, caterers, retail outlets and their contact information) and the items to be donated. It is also helpful if you have a brief description of the donated items for our mainstream visitors. b. A helpful suggestion: Whoever donates the food/beverage items takes care of getting the food to the venue, whether it is grouping food orders from one establishment and one person brings them. Each establishment is asked that the food to be donated should be cooked no later than one hour before pick-up time. This is to make sure that there is no opportunity for food spoilage to happen. This does not apply to baked products that do not contain meat or seafood, vegetable dishes, fruits and cheeses or food items with a high sugar or salt content. d.	No raw food items, such as “Kinilaw” (Ceviche). e.	How to determine serving portions: Lumpia shanghai is 2 pieces is equal to 1 serving; large empanada is 1 piece, equal to 2 sliced servings; Large banana turon is 1 piece, equal to 2 sliced servings. f.	Please be mindful about our vegetarian guests. Let’s make sure we have vegetarian items on the menu. From Food Distributors, Retail Outlets, and Groceries from the frozen section and produce departments – Your group can assign a caterer-volunteer to cook and assemble these items for the event. From Restaurants and Caterers: This is only a starting list. 1. We need to ask the establishments what they recommend. 3. Ask the donor-caterer that if they would be willing to come and celebrate with us, bring their donated items as well as their customers’ donated food items. Kakanin: Filipino Snack Foods (Please coordinate with Helen Marte Bautista re: this since a group of friends are coordinating this! 415 564-9765) – Banana Fritters; Turon; Cassava Cake; Leche Flan – cut and scooped into mini metallic cupcake containers; Puto; All the banana-wrapped puto, puto bumbong; Filipino-style hopia; Ube desserts, Etc. Supplies: Paper Napkins; Hand Wipes (in packets); Whatever paper goods we need; Any party supplies; Ice, lots of ice; if food warmers are needed, we will coordinate with you on October 23. Or, contact Helen Marte Bautista at 415 564-9765.